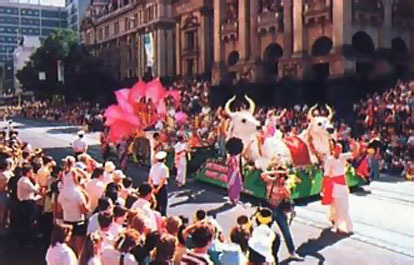 Melbourne, Australia—Devotees here recently participated in the 1985 Myer Moomba Parade, the largest annual parade in the southern hemisphere. Their float won the Ministry of Arts Award for the most original float, one of the top three awards. The float’s fourteen-foot-high pink lotus flower captured everyone’s attention. In the whorl of the lotus, seated upon a golden throne, sat Balarama dasa and his wife, Sri Lekha-devi dasi, dressed to portray Lord Krsna and Srimati Radharani. 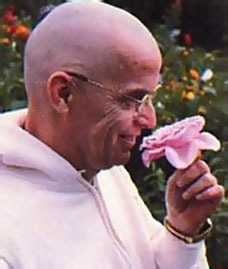 Balarama dasa is ISKCON’s regional secretary for the State of Victoria. At the center of the float was a sculpture of two swans swimming on a pond, and on either side, wearing colorful Indian costumes, sat devotee women and children portraying the cowherd girlfriends (gopis) of Radha and Krsna. Sculpted peacocks, butterflies whose wings moved in the breeze, frogs, white birds, a bull, a cow, and two calves completed the scene. Devotees danced in front of the float and chanted Hare Krsna to the accompaniment of drums and hand cymbals. Six hundred thousand spectators viewed the parade, which was also televised across Australia, in Japan, and as far away as England. 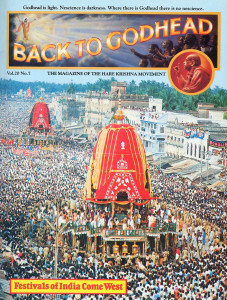 One television broadcaster described the float’s depiction of the lovely scene and then added that the devotees distribute two thousand free meals a week in Melbourne. At the end of the parade all the floats remained on display in a large park, where the devotees distributed tens of thousands of books and snacks. Recently Art and Antiques magazine named the top one hundred collectors in America. 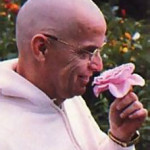 Its list includes Alfred Brush Ford of the Ford dynasty, also known as Ambarisa dasa, a devotee in the Hare Krsna movement. 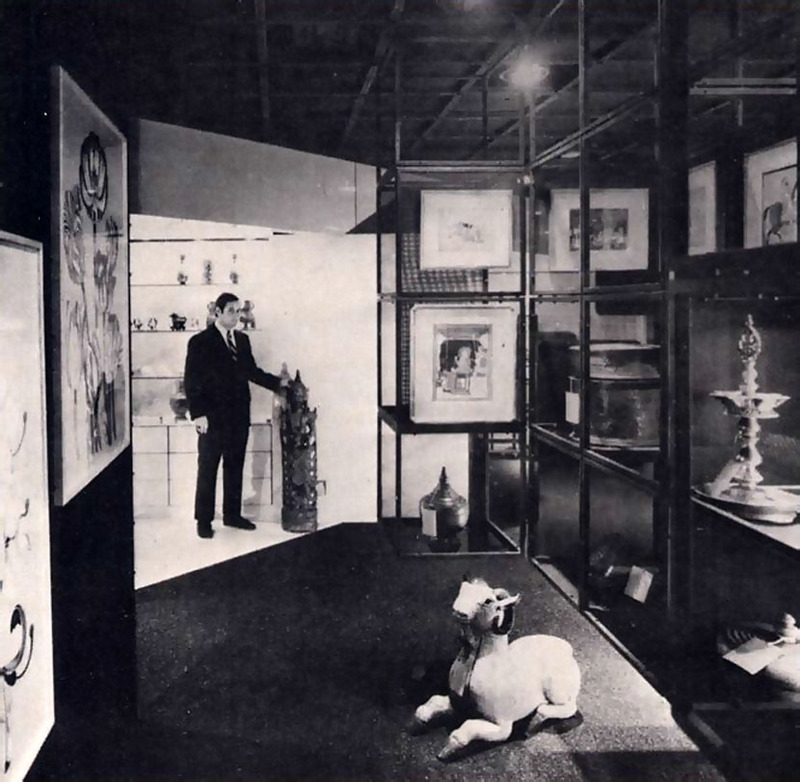 In 1980 Ambarisa opened the Ramayan Art Gallery (pictured above) in Detroit. This fall his large collection of Oriental art will go on permanent display at the Bhaktivedanta Cultural Center, formerly the Fisher Mansion, which Ambarisa spent $2.25 million to purchase and develop into a gorgeous showplace for Krsna culture. New Vrindaban, West Virginia—On May 31 Srila Kirtanananda Swami Bhaktipada, one of the present spiritual masters in the Krsna consciousness movement, presided over a ground-breaking ceremony here for the Temple of Understanding. The new temple will be the world’s largest Krsna temple and the most ambitious architectural project of its kind since the construction of the great temple in Tanjore, India, in the eleventh century. The temple will be twenty times larger than the famous Prabhupada’s Palace of Gold. Designed to accommodate 1,200 visitors at one time, it will stand 216 feet high and will include a theater, art gallery, planetarium, museum, cafeteria, and gift shop. The temple and plaza area will occupy 200,000 square feet. Completion of the temple complex is scheduled for 1992. The temple proper will be open to the public in 1988. U.S. Congressman Alien Mollohan was on hand at the ceremony to deliver the keynote speech.